Here's my first new jar of pickles this year! 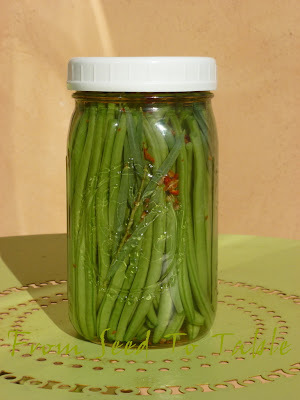 I finally harvested enough Rolande filet beans to fill a quart jar. These are refrigerator pickles, no blanching, no processing, no fuss. The vegetables stay crisp and snappy and fresh tasting. They keep seemingly forever in the refrigerator, if you don't devour them first. These were adapted from my recipe for Pickled Sugar Snap Peas. I've included this green bean variation in the recipe. Lettuce and peas and beans. That's the bulk of the harvests in the past week and believe me I am not complaining, it's all been so yummy. The next time I plant the filet beans though, I'm going to put in twice as many plants. They are prolific producers but you don't get as much since you harvest the beans small. They would be very good picked even younger than I have been doing but then I wouldn't get enough at one time to satisfy the two of us. The caper harvests continue but I haven't photographed any of those, perhaps I'll remember to do so later this week. I'm really happy that my bushes have produced almost 1.5 pounds of buds so far, all those little harvests of a couple of ounces each do add up. Rolande filet beans - 19.4 oz. 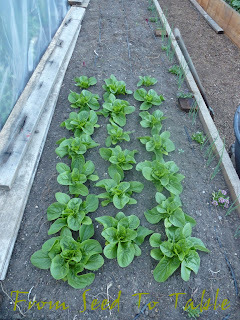 Sweetie Baby romaine lettuce - 11.4 oz. 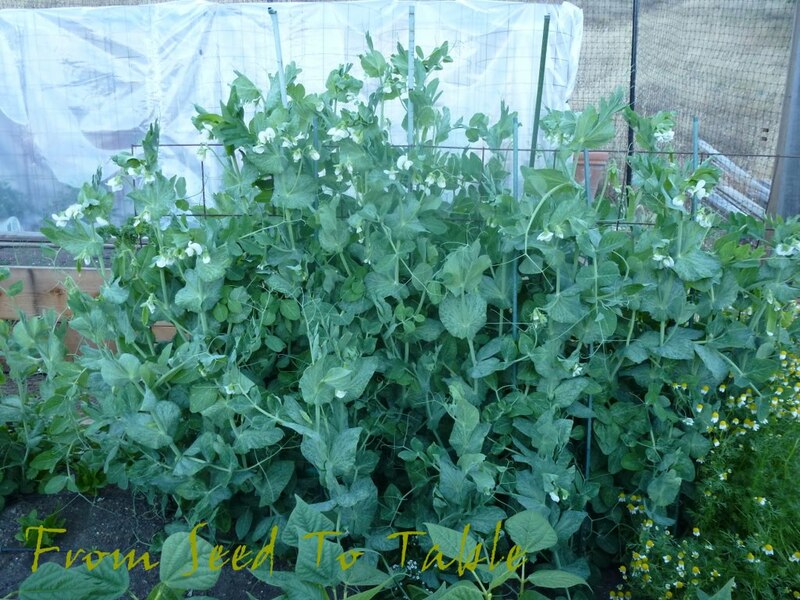 Oregon Sugar Pod II snow peas - 24.1 oz. The harvest totals for the past week were - 4 lb., .4 oz. Which brings the total for the year up to - 40 lb. I do believe that the veggies like their new beds. 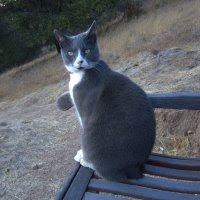 Of course, it has helped that the days are long and we've had mostly very mild weather, not too hot, other than a few days in the mid 80F's and not too cold, mostly in the high 60F's to mid 70F's. Nighttime temps still dip down into the high 40F's but the vegetables don't seem to mind that and the tomatoes are protected by their mini greenhouse so they are happy and even starting to set some fruits. I'm planning on removing the plastic cover from the cages around July 1, but in the meantime I need to get in there to start pushing the stems inside the cages. 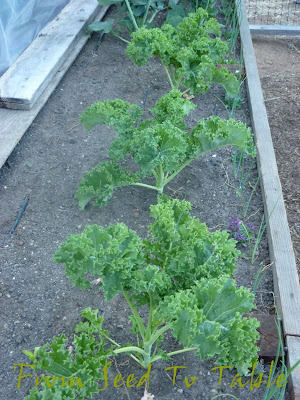 Here's a few more shots of the rest of the vegetables. The new bed has been almost filled with eggplant and peppers and a bit of basil. And now I must finish clearing out the final old bed to make way for the new. Yippee! Here's my first real harvest from the new garden beds. A small handful of Rolande filet beans and a couple handsful of Oregon Sugarpod II snow peas. 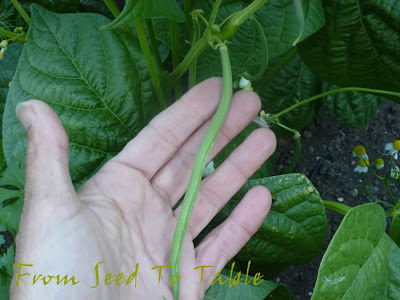 And Yesterday the garden yielded a larger handful of beans and more snow peas. And a very small handful of Lark's Tongue kale. I've also been harvesting small amounts of capers once or twice a week since early May. It's been three months since my last harvest post, it sure is nice to have something to show off again! Rolande filet beans - 8.5 oz. 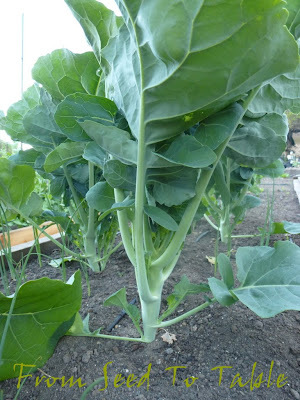 Lark's Tongue kale - 2 oz. Oregon Sugar Pod II snow peas - 13.7 oz. All of that pushes my total harvests for the year up to 36 pounds. Look how small that pile of soil looks compared to a couple of days ago. 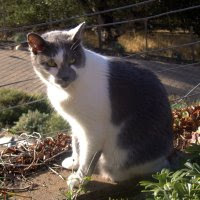 There's the trusty rusty wheel barrow in the background, sporting one of my favorite shovels. The favorite gloves now have a couple of holes worn into various high friction spots. The hat is a bit more, um, sweat stained. This bed contains approximately 11 cubic yards of soil. 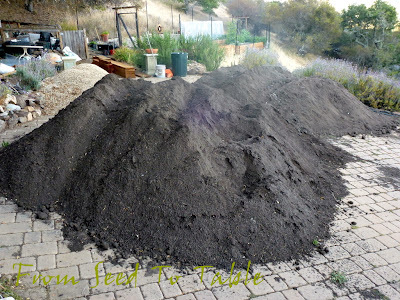 Did you know that one cubic yard of soil weighs about 1.5 tons? 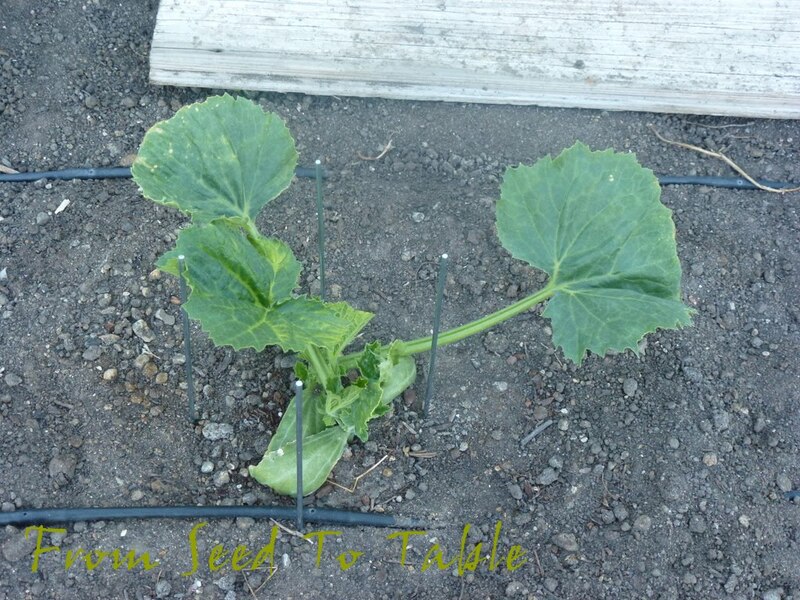 (Give or take a bit depending on the amount of moisture in the soil). Whew, that's about 16.5 tons (or 33,000 pounds or nearly 15,000 kilos) shifted from the driveway to the bed in the past three days. This woman who is almost exactly (tomorrow!) 6 years shy of 3 score years is TIRED. 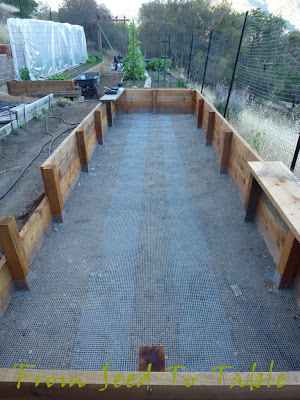 The drip lines go in tomorrow and the peppers and eggplants go in on Friday. I've had a couple of glasses of chardonnay and a bit of dinner and now I'm off to bed. We both made it to the top of Half Dome and enjoyed the spectacular views of Yosemite. 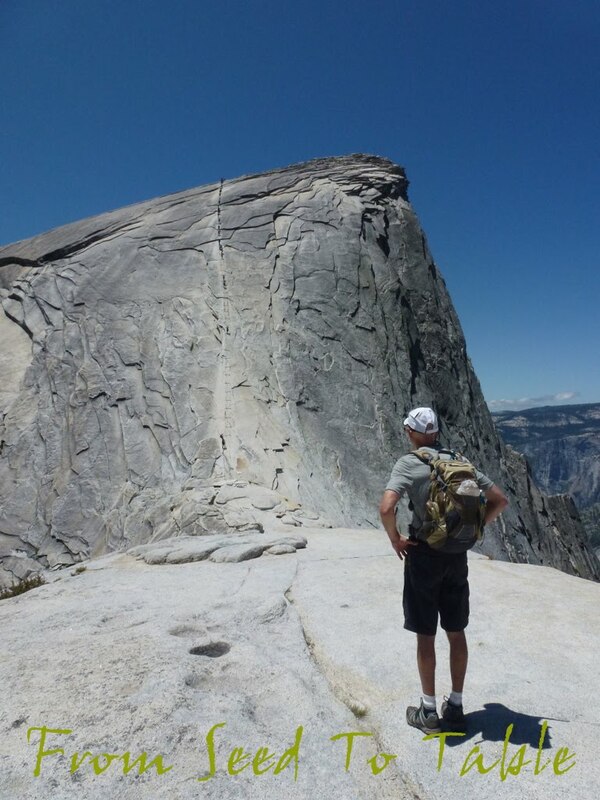 There will be more on that adventure one of these days on my new hiking blog, but don't hold your breath waiting, I only made it half way through that mountain of soil today. The Sweetie Baby romaine has more than doubled in size in the past 10 days. Salad soon. The Lark's Tongue kale is getting prettier every day. Kale Caesar anyone? The Apollo broccoli is also growing like crazy. And it is promising numerous side shoots. 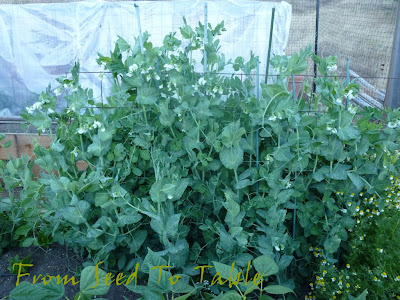 The Oregon Sugar Pod II snow peas are lush and in full bloom. 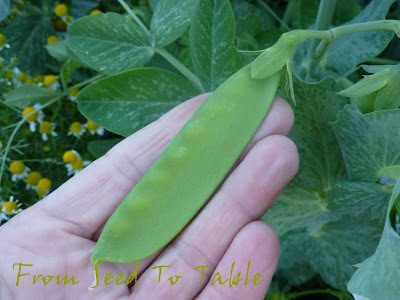 I'll be harvesting the first snow peas tomorrow! Look at those Greek Gigante beans. They have already sent runners past the tops of their trellises. And they are sporting beautiful snow white flowers. 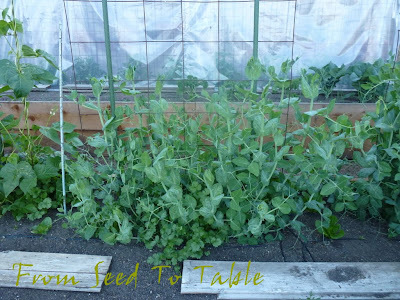 The Super Sugar Snap peas are going through a growth spurt but are not ready to bloom yet. The Neckarkönigin green beans are getting settled in and are just starting to develop their runners. Cucumbers - ready, set, go! 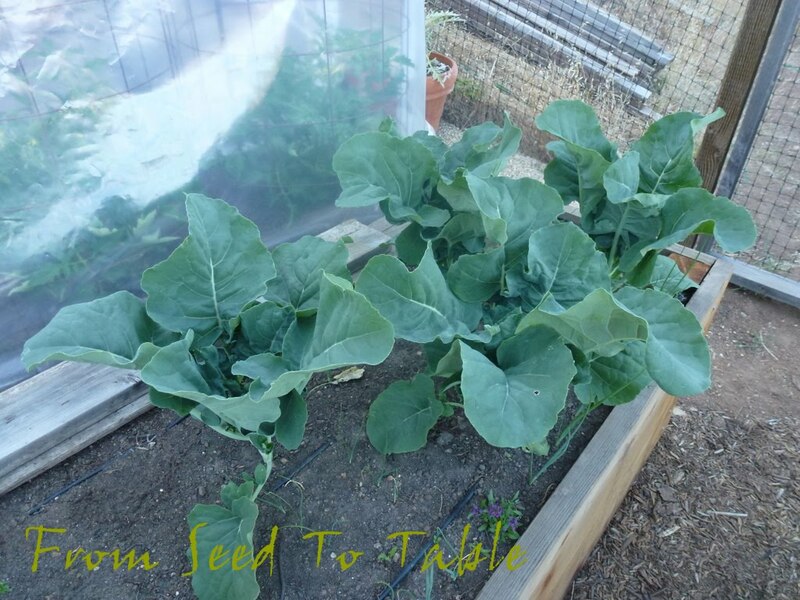 I've been planting out more of the summer vegetables in the past week. Here's the bed where I planted the tomatoes just 10 days ago. The tomatoes now have some "Sweetie Baby" romaine to keep them company. And some "Apollo" broccoli and "Lark's Tongue" kale. The edge of the bed is also home for some "Summer Romance" sweet alyssum seedlings with some "Parade" scallions filling the gaps. Look how much the tomatoes have already grown! They do like their "greenhouse". The daytime temperatures have been topping out in the mid-50ºF's to high-60ºF's lately with nighttime temperatures down in the low 40ºF's. The tomatoes would not be this happy if they were left to shiver outside unprotected. 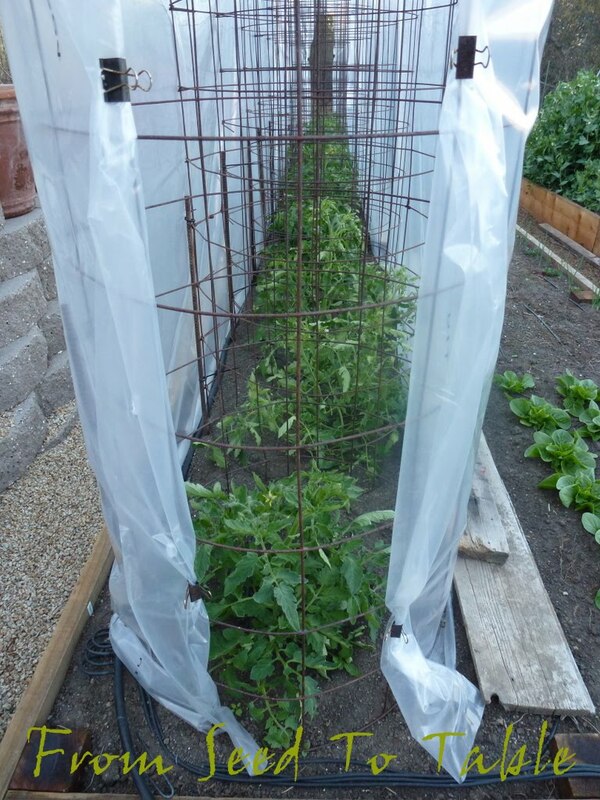 I think the investment in the greenhouse plastic is a good one. 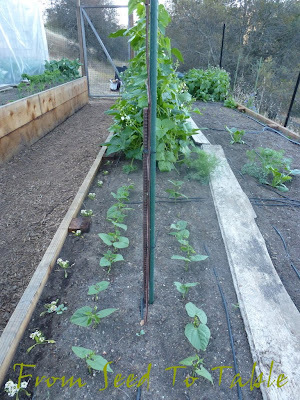 On the other side of the main path, the "Oregon Sugar Pod II" snow peas are loving the cool weather (pretty normal weather actually, perhaps just a tad cooler than usual). 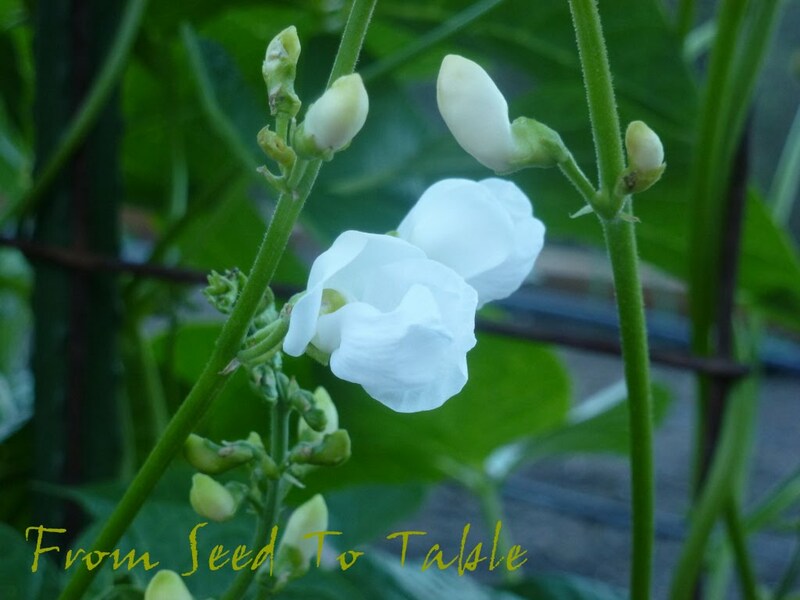 The "Rolande" filet beans have been blooming for the past week. The first baby beans are showing off. 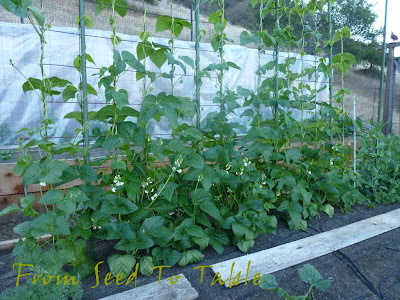 The Greek "Gigante" runner beans are climbing their trellises. And they are forming the first clusters of flower buds. 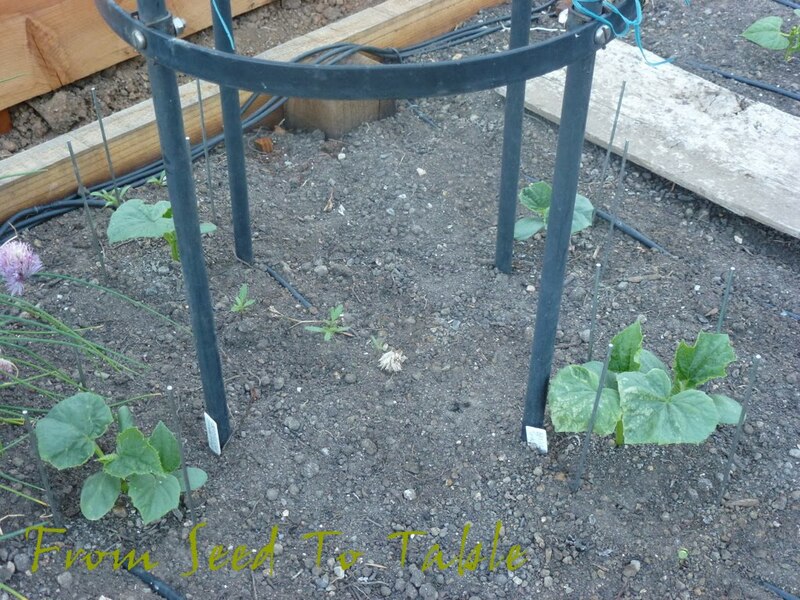 The "Super Sugar Snap" peas are just starting to take off. And here's the newest addition to the legume family collection, "Neckarkönigin" green beans. Well, I actually grew these last year, but they were at their prime when I was on vacation and by the time I got home most of the beans were overdeveloped. I hope to get to try them at their best this summer. The "Green Fingers" Persian cucumbers and "Tasty Green" Japanese cucumbers are being coddled in their own little water bottle cloches. Both of these cucumbers were wonderful last year, disease resistant, prolific, and most important, tasty. Beyond them are a couple of cloches protecting new seedlings of "Da Fiore" zucchini, back again for year 3 or is it 4. 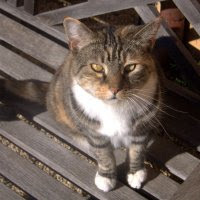 The soil for the newest bed hasn't been delivered yet, I've been working with my contractor to find just the right stuff. He brought a sample yesterday that is up to snuff so I hope to get the bed filled next week. Just in time, the babies in my little makeshift greenhouse are ready to go! I have 3 varieties of eggplant - one of my favorite varieties "Diamond" and a couple of new varieties, "Kamo" and "Salangana". And then there's the peppers that are too numerous to identify in this post but you can read up on them here. And elsewhere around the garden... These pots were full of peppers last year but this year I switched them over to herbs. From left to right are Texas Tarragon, Purple Sage, Lemon Verbena, Syrian Oregano, Garden Sage, and Tarragon. It will be handy to have these close to the kitchen. And I also planted up a couple of pots of "Profuma di Genova" sweet basil, my favorite variety. I'll use the potted basil for regular snipping but I also have more plants to put into the vegetable garden to allow to get big enough to harvest large amounts for pesto. 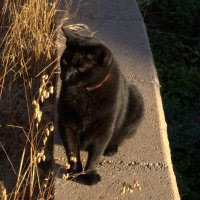 And I'm really happy to report that I had a few Crimson Flowering Favas survive the rat attacks last autumn so I'll be able to renew my seed stock. Can you identify what the plant ties are made from? Hope your summer vegetable garden is off to a great start!